Josiah Mory helps store owners on Shopify improve their customer experience with customer research. But he wasn’t always a consultant. Josiah put in the work, made a few mistakes along the way, and now he’s sharing with us today every twist and turn he took on his path to becoming a freelancer! This episode is all about the most powerful ways you can go from employee to freelancer. Even if you don’t have any clients lined up. You can still make the freelance transformation with confidence as long as you’re willing to put in the effort. When making the change from full-time to freelancer, where do you start? Josiah asked himself - “what else are you good at?” This is a popular question among employees daydreaming about freelancing, and it helped Josiah pick out a skillset and start honing it. His experience led him to the technology space. 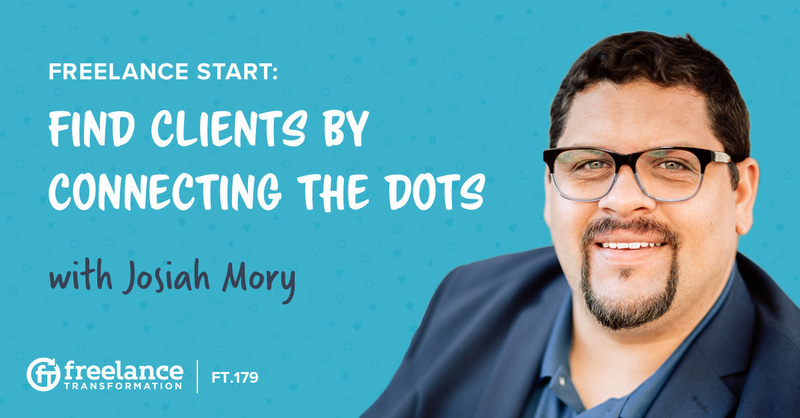 He taught himself coding, picked up a few side hustles, and struggled to build a client list. Even coming from a background of having had my own business and networking...there were still a lot of things that were new to me. This is right around the time Josiah signed up for my Freelance Start Program. He was debating whether to start his own business or simply apply for the 9-5, and he honestly had no clue what to do. Because being a freelancer is not easy. Josiah bounced back and forth between potential clients and job applications. He even gave up on his freelance business the first time around because the lack of the success was so discouraging. Transforming into a freelancer is not an overnight success story. Josiah learned that freelancers need tangible business goals if they want to be successful. And these goals are more than just sales. Freelancers are always repositioning their business to meet their evolving goals, and networking is key to that positioning. It didn’t take long for Josiah to catch on to how important building relationships is to running a freelance business. Building relationships can’t start with a conversation. Josiah started engaging with people online until he found his niche. Once he found that niche, Josiah put in the real legwork to meeting people and networking. I just went into it trying to make connections, trying to re-establish connections, trying to make friendships. Nothing changed...it was just a mindset shift for me. For Josiah, these connections were all about discovery. Learning new things about the people you want to work with can be an incredible turning point for your freelance business. You never want to bring the conversation to a selling point. It creates a dissonance that won’t work for your brand. Instead, listen to people when they talk and pay attention to what’s valuable to them. It comes from a more genuine place, and these conversations will be more fruitful if you are genuinely involved with their concerns. Use Facebook groups and blogging communities to engage with your audience. But pay attention to the communities your niche is actually using. Josiah used Facebook as a jumping off point but explored many other options as he networked his niche. Blogs and message boards can be a goldmine for the right kind of freelancer. Finding his niche made it possible for Josiah to become a full-time freelancer, but try not to overthink it. Having a conversation does not have to be complicated. For starters, Josiah recommends talking it up with the people you already know and the customers you already have. The more people you talk to, the more you will learn and the more connections you will make. These connections can quickly become clients if you keep a genuine relationship. Being able to draw a line more directly between what I do and purchases that are being made...makes me happier and makes it easier to explain what I do. Building a network isn’t easy, but the effort you put in can really pay off in the end. Look at it like connecting the dots. Don’t try to see the big picture right away. You need to have your goals, of course, but it’s impossible to apply your big picture goals to a small conversation in a coffee shop. It isn’t fair to you, and it’s not fair to them. Instead, approach the conversation for what it is - a bite with a friend who may be able to teach you something new about the business you are trying to build. The big difference was the mind-set. Because I didn’t care at the end of the day if the dots connected or not. The thing that I cared about was the number of conversations I was having and re-connecting with people. You can make the freelance transformation by reaching out to people and seeing what’s out there. Clients respond better to a conversation that is genuine. So take that pressure off yourself by just reaching out to friends and acquaintances and seeing what happens. As cheesy as it sounds, a friendly demeanor can really change the course of your freelance business for the better.